During lunch today I added a module to my photo gallery that allows me to tag photos or albums with latitude and logitude such that they are marked on a map. Using Google Maps along with the Google Maps Module for my photo gallery software, in less than 15 minutes I was able to mark my photos and albums on the earth. I can tag photos or albums by type, so that when browsing the map, different types can be turned off or on. You can also define places to quickly zoom in on. There is a facility to map routes (like this), but haven’t tried that yet. When you click on one of the marker pins, a preview window will pop up, with a thumbnail for that photo or gallery, a link to the item, and the title or description. It’s all very slick, and it worked on my first try. If your browser works with Google Maps, it will work with this. Go check it out! This is the most useful of all the Stuart Collection items. Yes, it’s just a drinking fountain. 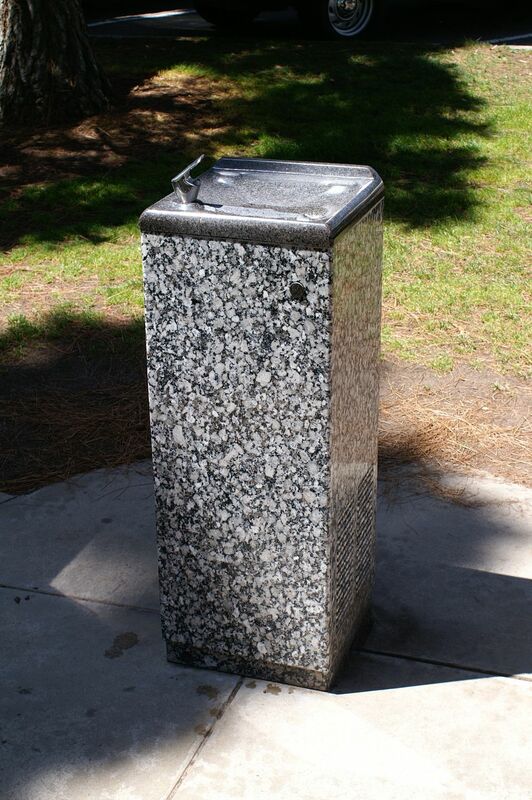 Actually, it’s a refrigerated drinking fountain, and it’s by Michael Asher, done in 1991. The fountain is made of two kinds of granite, and looks exactly like the fountain you’d find in many buildings. I guess there’s supposed to be some kind of symbolism in this, with grass surrounding the fountain, & the history of the site as an Army shooting range. However, it feels kind of stretched in my opinion. The irony here isn’t very strong. In the end, it’s just a drinking fountain, one that’s perhaps more interesting than most. Found parked alongside US101 on the way to Eureka. He lives in it, has pedalled it all around the US, has been doing this for years. The vehicle weighs 600 lbs or so. The panel above the seat is just a sun/rain shade, not a solar panel. The mechanical details were nicely done but I think the aerodynamics could be improved. On the other hand it’s geared low and likely never goes very fast. Small bike wheel in front, fat rubber-tired go-kart wheel in back. I didn’t look to see what kind of brakes. All in all it’s pretty amazing that the guy could live in and pedal the thing around. I talked to him a bit, and as you might guess he seemed mildly unhinged. My question is how does he get the thing started? Getting 600 pounds moving is no small task. And going uphill? He appears to have at least three levels of down-gearing. How does he go fast enough to not fall over? Maybe he has to spin the pedals at 120 RPM to even go anywhere. I also don’t think the sun/rain shade could be that effective. To me, if I wanted to protect myself against the elements, I would get some kind of acryllic shell to go over the rider’s position. It would also be much more aero. Maybe I’m just more sane that this guy, but if I were to do this sort of thing, I’d get a bike trailer to load all my stuff behind a normal bike. Then I could ride a normal unhindered bike if I wished, leaving the trailer at the campsite. I’d have to sleep in a tent, but that’s okay.